Love my cute elephant statue in blue, hand carved out of wood. Looks cute in my family room with some glass beads I put around his neck! Art & Artifact Reading Elephant and Squirrel Sculpture - 10" Tall Figurine - 10 in. 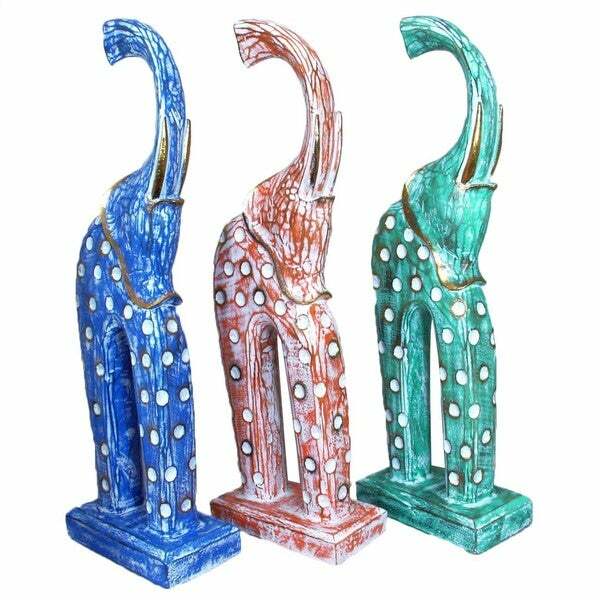 The Mirah Sarawasti family of Bali hand carves these cheerful Elephant statues from native albesia wood. Each handcrafted, and uniquely painted with a color washing technique, then accented in gold giving it a rich warm glow, ensuring that no two pieces are alike. Perfect on any bare table top or accented next to a stack of books, this beautiful wood figurine is sure to start a conversation in any room. From the many islands of Indonesia rich in culture and tradition, these decorative pieces are hand made by artisans using sustainable materials. Modern Indonesian painters use a wide variety of styles and themes, a diversity and unique style that is reflected in these items. Option: Elephant Fotul Dots Blue 32"
Option: Elephant Fotul Dots Blue 24" | Elephant Fotul Dots Green 24"
Option: Elephant Fotul Dots Orange32"
It’a very beautiful agains a window and looks even better in person.